President Donald Trump is striking back at Beijing by asking his administration to identify $200 billion worth of Chinese goods for additional 10-percent tariffs. “We have no choice. This should have been done many years ago,” Trump said at the National Federation of Independent Business’ 75th-anniversary celebration on June 19. The White House’s top trade advisor, Peter Navarro, said Beijing “may have underestimated the resolve of President Donald J. Trump” by refusing to meet the U.S.’ trade demands. “If they thought that they could buy us off cheap with a few extra products sold and allow them to continue to steal our intellectual property and crown jewels, that was a miscalculation,” he told reporters on a June 19 conference call. The United States demands that China cut the trade deficit by $200 billion and stop stealing American technology. “[Trump] has given China every chance to change its aggressive behavior,” he added. Last year, China was given 100 days to come up with proposed structural changes. There were numerous meetings with Chinese delegations, but none of these efforts resulted in any progress, he explained. As a result, the United States announced on June 15 that it is moving ahead with a 25 percent tariff on $50 billion worth of Chinese goods. The action prompted an immediate response from China, which announced it would raise tariffs on an equal amount of U.S. goods, including beef, poultry, tobacco, and cars. China has also threatened to impose tariffs on U.S. crude oil imports, which are now worth almost $1 billion per month. “This latest action by China clearly indicates its determination to keep the United States at a permanent and unfair disadvantage,” Trump said on June 18. He asked the U.S. Trade Representative to identify $200 billion worth of Chinese goods for additional tariffs. Washington is ready to impose more tariffs on top of $200 billion if China continues to retaliate, Trump said. The tariffs will go into effect after the legal process is complete, according to the White House. Beijing is running out of American goods it can slap tariffs on, experts say, simply because it doesn’t import as much American goods compared to what the United States imports from China. China imported nearly $130 billion from the United States last year, compared with $505 billion in exports, according to the U.S. Census Bureau. 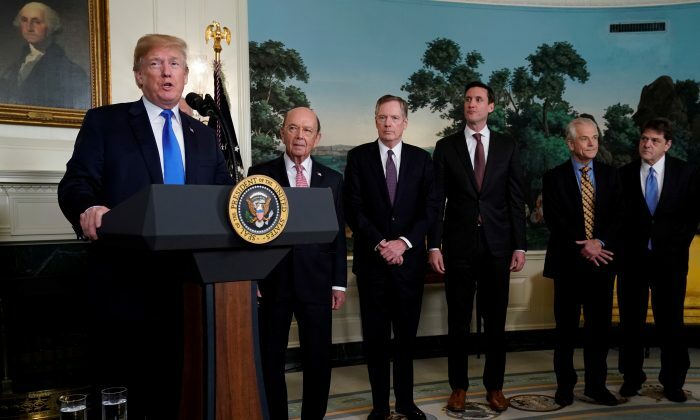 “China made a major mistake early Saturday morning when it pledged to mirror the initial 25 percent U.S. tariffs on $50 billion of their exports,” wrote Derek Scissors, Asia economist at the American Enterprise Institute. According to Scissors, Beijing walked down a path where it is guaranteed to a hit a wall since it has a limited number of measures to use in a tariff war. China, however, can still retaliate using some other measures, he wrote. “The bilateral relationship is large and multifaceted; there are many choices. An obvious one is to punish American firms operating in the PRC,” he said. Although China has a handful of other measures, according to experts, they are not as easy to implement as tariffs. Trump made it clear that he would not tolerate any type of Chinese response that harms American businesses, whether it is a farmer in Iowa or an American company in Shanghai, Navarro said. For decades, the Chinese regime’s protectionist and trade-distorting policies have hurt American industries. According to the IP Commission report by the National Bureau of Asian Research, the annual cost of IP theft to the U.S. economy could be as high as $600 billion. China uses many tactics to steal technology, such as forcing foreign companies to partner with domestic firms and hand over their intellectual property and know-how to gain access to the Chinese market. The Chinese Communist Party wants to turn China into a “manufacturing superpower” by replacing foreign competitors in global high-tech markets. Its economic blueprint, the “Made in China 2025” program, outlines 10 tech-related sectors it wants to develop by 2025, including advanced information technology, robotics and automated machine tools, aircraft and aircraft components, advanced rail equipment, and new energy vehicles. Trump will not allow China to use its established unfair trade practices and illicit behavior to capture the so-called “Made in China 2025” industries, said Navarro.